Is the Cataclysm Already Upon Us? 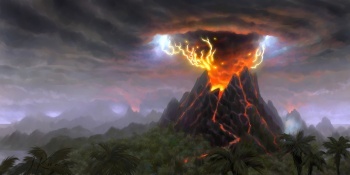 Blizzard may be laying early groundwork for the World of Warcraft: Cataclysm world event - either that, or Azeroth is built on top of an earthquake zone that makes the San Andreas Fault look like a wuss. Now, given Blizzard's tendency to be a bit, shall we say, "nebulous" about its release dates, no one has really been able to pin down a launch date for Cataclysm, the third expansion for mega-MMOG World of Warcraft, beyond "oh, sometime next year." Still, that doesn't mean the company can't start laying the groundwork for the grand world event to usher the expansion in. While Burning Crusade had the hubbub over the opening of the Dark Portal, and Wrath of the Lich King had the zombie invasion, Cataclysm will be shattering - and completely reshaping - Azeroth as gamers know it. So it makes sense that Blizzard would want to, y'know, prepare a bit early. There's been some intriguing gossip in WoW circles about small, seemingly random earthquakes happening as players go about their business. You'll be standing at the Auction House in Orgrimmar, browsing the vendor, or fishing off the coast of Howling Fjord when suddenly your screen will shake for a couple of seconds... and then nothing. While those intrepid WoW fans that dive through the game's files haven't unearthed any information about the world event itself via datamining, they have discovered something interesting: Little invisible NPCs called "Shaker" and "Shaker - Small" were added to the game in Patch 3.2.2 and Patch 3.3, respectively. As far as we know, these might be the little creatures behind the earthquakes, wandering around undetectably and making the screen shake for any player they pass by. As a WoW fan, it's a cool little feature, and certainly lends credence to the idea that the Cataclysm world event will be taking place over months, not weeks or days. After all, we're still fighting the Lich King, and the beta test hasn't started yet, which indicates that at the earliest, Cataclysm won't be here until May or June - and probably later, depending on how comfortable Blizzard is with releasing another major PC title next to StarCraft II. So remember: If the screen starts shaking, it's probably just an invisible Shaker early tremor, and you should go stand in the doorway. Unless you're in Un'Goro Crater, in which case it's a Devilsaur and you're boned.